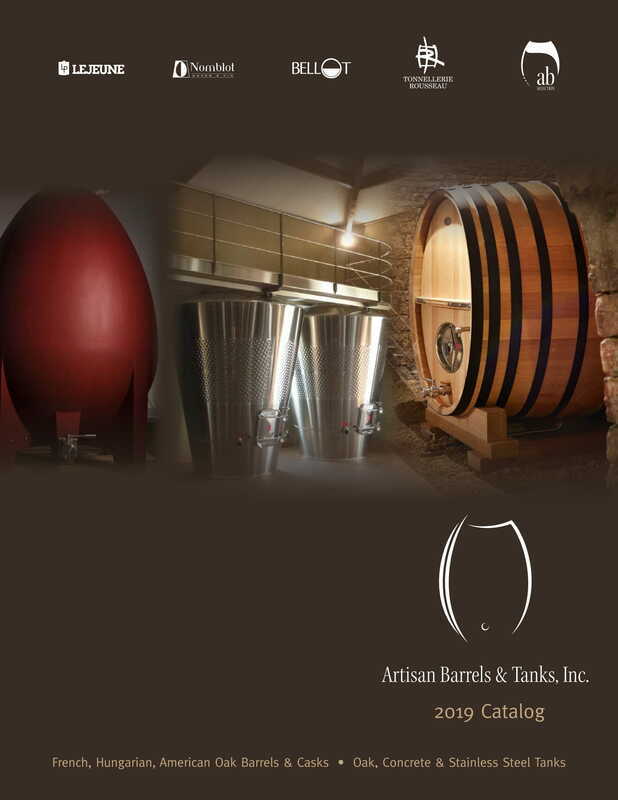 Savoir-Faire - Artisan Barrels & Tanks, Inc.
​A good portion of French oak forests used by coopers is owned by the government (50% of all oak forests in France). The "ONF" (Office National des Forets) harvests and manages the forests. Two main oak species can be found in both privatly owned and government managed forests : Robur oak (Quercus Robur) and Pedunculate oak (Quercus Pedonculata). The wood is inspected by the cooper or the wood broker in the forest and bought at end-of-the-year auctions (winter) when the tree's sap level is lowest. The defects-free wood logs are then cut to rough stave size and split mechanically (as shown above) with axes following the grain of the wood. The staves are stacked and open-air dried for a minimum of two years. This ageing in wind, rain and sun serves to diminish the wood's harsh, sappy flavors as well as reducing the excessive oak tannins. The shell is heated over an open fire, causing water in the wood to steam, which allows the staves to be bent without cracking. This takes about 20 minutes. Afterwards, a cable and winch are used to close the other end, which is then hooped. The second firing or toasting regimen, lasts between 20 and 30 minutes depending on the toasting level. It conditions the barrel and relieves stress. The interior becomes drier and hard where it is closed to the fire, while the outside softens and stretches as it warms. Aside from oak selecting, toasting is the most important barrel making stage for the winemaker. Each cooper has its own way of doing it, its own “recipe” to best fire and “cook” a barrel. One can choose from light , medium long, medium plus or heavy toast levels, each of which has a significant flavor profile ranging from slightly toasty (grilled bread) to caramelly (butterscotch, vanillin, creamy texture) to smoky (bacony, smoky, tar). A heavily toasted barrel can even be brought to the burnt point (char) and the winemaker uses it as a minor component in his blend or as a statement. The aged staves (from 24 to 36 months) are sorted and the damaged ones culled. Staves are cut to size, planned and shaped to obtain the desired concavity and form. Then, edges are jointed in order to form a circle when bent and assembled. Despite the different widths of staves, the angle remains the same. The staves are jointed and temporarily hooped at one end to form an open cone shape. This is called “raising the barrel” or “montage en rose”. Barrel heads are made separately: head pieces are planned and assembled using dowels. A river reed is used between the joints to seal them perfectly. Further on, barrel heads are edged and headed into the shell using a traditional dough (prepared with cold water, rye flour and a little wood ash). Sanding then takes place and must leave the barrel external surface smooth and better finished. The cooper inserts six to ten galvanized steel hoops to keep the barrel tight. Watertight testing is implemented to control the barrel's integrity and the detection of leaks. Barrel heads are individually hand-polished and fire-branded to ensure a perfect finish. The winemaker may consider shape when choosing barrels. A Bordeaux barrel - used for aging Bordeaux varietals such as Cabernet Sauvignon, Merlot, Cabernet Franc, Petit Verdot and Malbec - is taller and narrower than the Burgundian (Chardonnay and Pinot Noir) barrel, which is short and fat. There is also a choice in stave thickness: “Château” barrels with their thinner staves - which age wine faster - and the thicker, sturdier “export” or “transport” barrels can be stacked on several highs and are mechanically more sound .